In the wake of the management crisis at the Walt Disney Company in the early and mid 1980s - a story of some detail and great interest to those with a love of Hollywood dealmaking and animated entertainment alike, that has been told fully elsewhere - one of the many new ventures the company's new overseers started pursuing was television animation. This was a far more radical proposition at the time than is even imaginable all these years later, when some of the most important and respected animation in the world is being produced for TV; back in those days, "television animation" was as much as anything a euphemism for the cheapest, most technically ungainly kind of half-assed scribbling suited only for the slack-jawed, undemanding children who made up the entirety of the medium's target audience. Not a place for the company that, even in its decline, prided itself on the most expensive, detailed animation being produced in America. But onward the plan went anyway, in the hopes that Disney would be able to raise the quality of American television animation simply by refusing to sink to that level. A new division of the company was created, in part to distance the rehabilitating Walt Disney Feature Animation from its cheap and possibly failure-bound sibling, and on 14 September, 1985, the first two products of this exciting new direction premiered on two different networks: The Wuzzles and Adventures of the Gummi Bears. They both flopped: the first flickering out after a feeble 13 episodes, the latter managing to patch together enough Saturday mornings to hit the 65-episode threshold that's the standard length for an American cartoon to survive in syndication. Undaunted, the company backed away from awkward original ideas involving fantasy animals, and returned to the stable of classic Disney characters to create a third series, DuckTales. Conceptually based on the Uncle Scrooge comics created by the legendary Carl Barks, the show was the hit that the television animation needed to justify and perpetuate itself, and some 30 or 40 series later, the rest is history; though I do not think it's mere nostalgia if I claim for DuckTales the honor that it is the best of all these many series. Towards the end of the series' run, the decision came down to produced a theatrical feature, and thus we finally come to the point: DuckTales the Movie: Treasure of the Lost Lamp, released in the summer of 1990, the first animated film ever released by Walt Disney Pictures that was not a production of the feature animation department. Instead, it was credited to something called "Disney Movietoons", which is exactly what it sounds like: the ad hoc name given to protect the "real" films from the unmistakably cheaper production animated in its entirety at Disney's newly acquired animation studios in France. What plans, if any, existed for the Movietoons brand are lost to history; whether a whole string of features based on Disney cartoon shows were hoped for, or if it was going to be the temporary solution it proved to be. In the end, only two features were ever released under that banner. So! let us consider the first of these peculiar little orphans in the Disney animation universe. 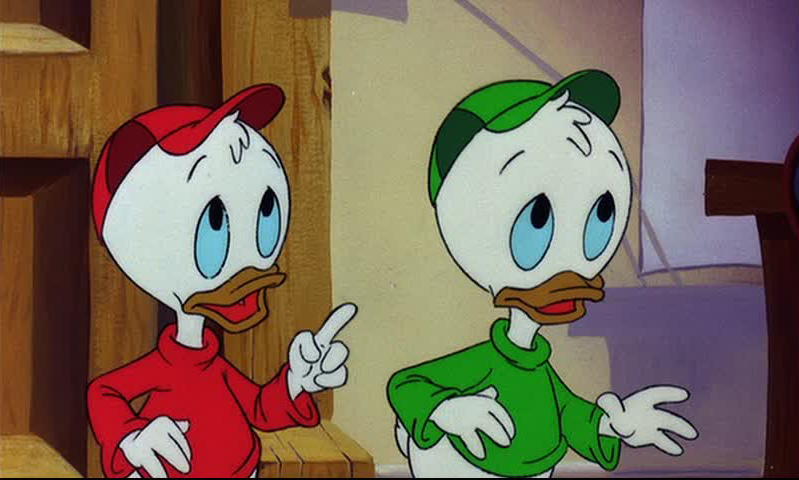 The plot, in its broad form, is familiar from many episodes of the TV series: the wealthiest duck in the world, Scrooge McDuck (Alan Young) is on a treasure hunt with his nephews Huey, Dewie, and Louie (Russi Taylor in all three cases); he crosses paths with a colorful antagonist; his fortune is jeopardised as a result. It was a formula that had worked like gangbusters since the character's four color debut, and changing it would have pointless as well as angering to the series' fans; all that Treasure of the Lost Lamp does in increase the scale of the conflict a bit by emphasising a pronounced layer of fantasy that was present in the show, but not to such an excessive degree. This is, in fact, a sort of adaptation of the "Aladdin" story from the Arabian Nights, two and a half years before Disney's "actual" Aladdin: the treasure Scrooge is hunting for this particular trip is the legendary lost hoard of the thief Collie Baba, lost in a Middle Eastern desert; unbeknownst to the ducks, tha hoard includes a magic oil lamp. Unfortunately for them, someone who does know this is the lamp's previous owner, an immortal shape-changing sorcerer named Merlock (Christopher Lloyd), content to let Scrooge and company do all the hard work of finding the lamp for him, whereupon he intends to... take over the world? It's not even a bit clear, actually, what motivates Merlock beyond having a spectacularly bad mood. Anyway, the ducks find the lamp and accidentally release the genie (Rip Taylor) inside; wishing-time shenanigans ensue, followed by a pitched battle against Merlock on his floating death palace. First things first: "Merlock" is a stupid name. 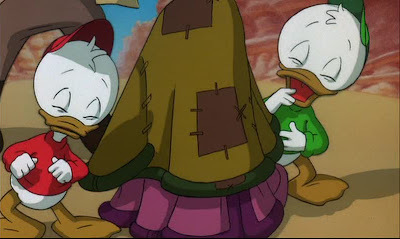 Second things: for all its charms, most of them bundled up into the first third of the short feature, Treasure of the Lost Lamp is not really a top-tier DuckTales story. A lot of this has to do with the villain: he's far too intense and grim and "big", a visually dramatic character performed without a lick of ironic detachment by Lloyd, who'd be a much better fit for one of Disney's fairy tale adaptations than a comic adventure romp, the primary mode of DuckTales as a series and of this movie itself. And a lot more has to do with the genie, a rather irritating character whose function as a comic character falls into two camps: 1) it is funny when Rip Taylor is shouty; 2) a character who has been buried underground for several hundred years is good for all sorts of wacky fish-out-of-water misunderstandings about the 20th Century. Both of these contentions are wrong. Still and all, the core of DuckTales is itself sturdy enough to withstand a lot of narrative missteps, particularly with Alan Young's commanding and authoritative performance of Scrooge leading the way. The opening sequence of the film, where it feels the most like the best of the show and, in a refracted way, like the best of the comics, is pretty great matinee-style adventure filmmaking, riffing on Raiders of the Lost Ark in much the same way that Raiders was admittedly a deliberate riff on Barks's Scrooge comics. The bulk of the increased budget that came with being an expanded theatrical project was plainly spent on the first 20 minutes, which probably can be explained in terms of the old animation trick that the most time and energy is spent animating the "biggest" sequences: the setpieces, or in this case, the opening that needs to justify the viewer's spending time and money watching something that has to be obviously better than what they can get at home. -than later on in the movie, when it returns to the settings (i.e. pre-established background plates) of the original show, and the palette and draftsmanship drop down to the level of the TV cartoon. Let us not for a moment forget that by the standards of late-'80s/early-'90s TV animation, DuckTales was at the very top of the heap; so to accuse the movie of dropping down to that level, I'm not implying that it's some out-of-control horror show. It's certainly not as good as what Walt Disney Feature Animation was producing at that time (for a little bit of sobering context: Treasure of the Lost Lamp came in between The Little Mermaid and The Rescuers Down Under), but for a movie released the same summer as Jetsons: The Movie, it holds its own. This is not, of course, the standard to which we'd prefer to hold anything with the word "Disney" attached; and there are certainly places in Treasure of the Lost Lamp where it becomes unbearably chintzy, mostly involving characters talking - too many times in the film, we hear dialogue that does not apparently come from the mouths of any onscreen characters, and there is one particular instance (a character coming to after having passed out, screaming, and passing out again, where the sounds she makes lead her movements by at least a whole second) that bothered me on a deep and abiding level even when I was eight years old. The film also suffers from the affliction common to new animators - which the staff certain was, for it is a matter of record that Treasure of the Lost Lamp, as the first vaguely "prestigious" project attempted at any of Disney's satellite studios, represents the first big project for a lot of important future animators who had not previously gotten a chance to show off - of overly-exaggerated movements, a certain tendency to flailing, or to emphatically gesturing when a small movement would suffice. Characters either fidget endlessly, or aren't animated at all; nobody stands still, and it's this element as much as anything that makes it hard for me to take the film as a serious work of animation for all ages, but reluctantly files it into the children's animation ghetto where, i'faith, DuckTales itself resides. Though at least, and this is not a trivial thing, for ghettoised animation, it's still a fun movie: plagued by a story that doesn't really go anywhere, anchored by new characters who aren't remotely as appealing as the stock company of heroes and sidekicks that don't even get a mention. But it's not the worst kiddie flick out there by any margin, and unlike many of the projects Disney Television Animation, in one guise or another, would put its name to in the next two decades, it doesn't seriously besmirch the good name of the House that Walt Built.